Database Systems Corp. (DSC) provides state-of-the-art products including call center phone systems and software solutions. These include voice broadcasting systems and services that are ideally suited for delivering call notifications and phone reminders. Our automatic message broadcast phone systems and services can confirm the delivery of materials to a geographic area. This is particularly useful for delivery of products such as phone books and hand delivered notices and marketing announcements. Our delivery confirmation solution contacts your entire delivery area by phone or contacts a certain percentage of each delivery area to verify that the delivered products arrive as intended. This service saves you time and money by automatically contacting your delivered base of households, simultaneously contacting hundreds to thousands of residents. Delivery notification messages can be delivered to individuals or to answering machines with a requested call back if the household did not receive the delivered item. Contact DSC to learn more about our delivery notification services and systems. Database Systems Corp. provides real-time monitoring as a standard part of our delivery notification service. These displays are available as the phone campaign progressively calls your clients. Problem areas can be immediately recognized and actions taken with your delivery service. Each route is monitored as calls are made to residents within each assigned route. When the designated number of verified deliveries has been met, the calling campaign will immediately cease for homes within this specific route. Our delivery notification phone system and service is easy to manage. 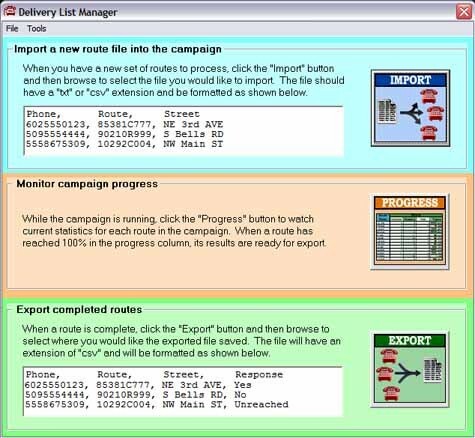 Using our Delivery List Manager, routes can be added, monitored and exported by your administrator. Using our online list manager, new routes can be added to our system easily. Route information contains the household phone number, assigned route, and address information. This data can be easily imported into our phone system using this online utility. As demonstrated above, our delivery confirmation phone systems and service can provide you with real time monitoring capability. Results appear as calls are made by our phone system. Should you need to use the results of this calling campaign in your delivery applications, we have provided a simple export feature that downloads the results of your calling campaign into an external file. This file contains the input route information with the call result appended to each item. Contact DSC for a FREE analysis and quote and to learn more about our delivery notification services.